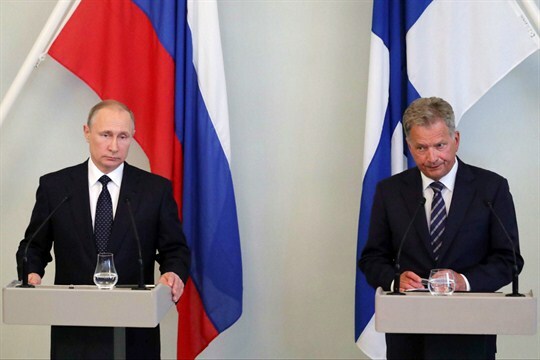 Russian President Vladimir Putin and Finnish President Sauli Niinisto answer questions during a news conference, Savonlinna, Finland, July 27, 2017 (Sputnik photo by Mikhail Klimentyev via AP). HELSINKI, Finland—Tucked away in an unassuming office building near Helsinki’s waterfront, a group of around 10 academics and government officials—most of them Finns—spend long days and nights tracking disinformation and influence operations emanating from neighboring Russia. They make up a newly formed research and strategy unit tasked with lifting the veil on a range of security threats that blend conventional and unconventional tactics.